Economy Rope Stand Chrome RS-CL-CH-SET Pack of 1 Chrome plated steel upright 51mmx1000mm with base 340mm diameter. Twin eye loops to hold rope hooks. Can be supplied with message holder. For use in all areas. Chrome stand. 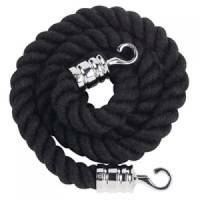 Rope 25x1500mm Black with Chrome Hooks VERRS-CLRP-CHBL Pack of 1 Rope with hooks fitted, supplied in standard lengths 25mmx1500mm. For use with economy or classic rope stands. Black rope with chrome hooks. 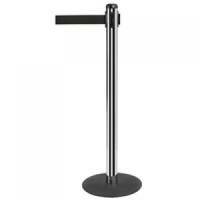 Economy Flexibarrier Stand Chrome VERC3BU Pack of 1 Economy Receiving Post. An adjustable barrier system at an affordable price. 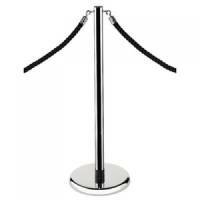 1000mm upright on a 340mm diameter weighted base featuring flexible 2 metre belt barrier. Colour - Chrome. Polished brass finish shown. 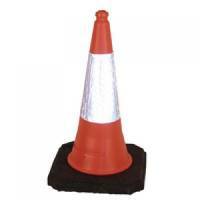 Red Standard One Piece Cone 750mm (Pack of 5) JAA060-220-615 Pack of 1 Large 750mm road cones. Stackable. Reflective sleeve for higher visibility. Pocketed design prevents water damage. Indented boss at top for attaching tape. Red. Reflective sleeve dimensions - Top 140mm. Bottom 230mm. Height 750mm. 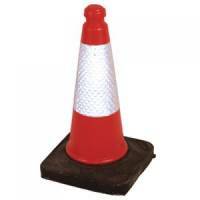 50cm Sand Weighted Cone Red JAA049-220-600 Pack of 1 Sand weighted cone. Stackable for easy storage. Reflective sleeve. Useful for a variety of applications. 50cm. Red. Pack of 1. 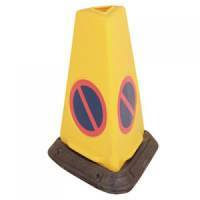 Yellow No Waiting Sand-Weighted Warning Cone JAD081-120-254 Pack of 1 Triangular traffic cone for imposing waiting restrictions. Designed in eye-catching hazard yellow. Printed with red and blue no waiting sign. Made from sturdy polyethylene. Sand-weighted base for stability. Pack of 1 cone. 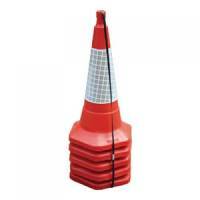 Red Weighted Traffic Cone With Reflective Sleeve 1000mm JAA060220654 Pack of 1 Large 1000mm road cone with sealed sand-weighted base. Stackable for easy storage. Reflective sleeve for higher visibility. Pocketed design prevents water damage. Indented boss at top for attaching tape. Colour: Red. 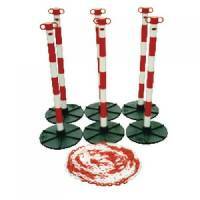 Demarcation Barrier Chain Support Post Red/White 404046 Pack of 1 Highly visible barrier to potential hazards and dangers. Made from plastic, it is strong, light and corrosion free making it ideal for use indoors and outdoors whether in an industrial, commercial or leisure environment. Red/White support and base. 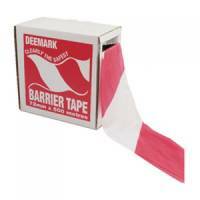 Flexocare Polythene Barrier Tape 72mmx500m Red/White 7101001 Pack of 1 Barrier Tape, ideal for cordoning off areas in warehouses and factories. Size 72mmx500m. Colour - Red/White. 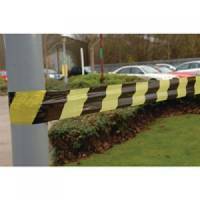 VFM Striped Tape Barrier 500m Black/Yellow 304927 Pack of 1 Suitable for indoor or outdoor applications. Versatile non-adhesive tape. Type - Yellow/Black. Width - 72mm. Length - 500m. 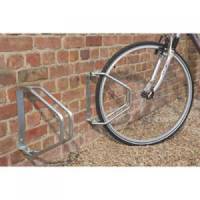 VFM Aluminium Adjustable Single Cycle Holder 320076 Pack of 1 Swings on 180 degrees axis, enabling space saving cycle storage at a desirable angle. Accepts all types of bicycle tyre up to a max width of 50mm. Easy installation, attaches to a wall with 2 screws (not supplied). Non returnable. 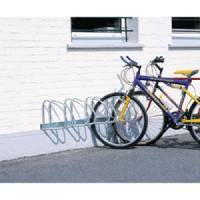 VFM Aluminium Wall/Floor Mounted 4-Bike Cycle Rack 320080 Pack of 1 Should be positioned approx. 15cm above ground level. Suitable for mounting on brick and concrete walls. 4 bike capacity with 45 degrees holders. Non returnable. 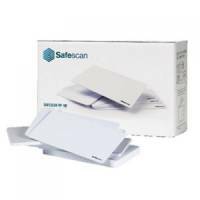 Safescan RF-100 RFID Proximity Badge Pack 25 Pack of 1 For use with every safescan ta rfid reader. 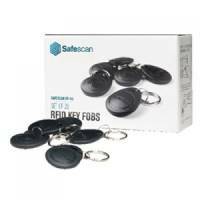 Safescan RF-110 RFID Key Fob Pack 25 Pack of 1 For use with every safescan ta rfid reader. Safescan 50 Counterfeit Detector with UV Lamp Black Pack of 1 Suitable for all currencies. 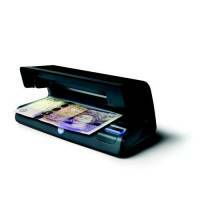 Safescan 70 Counterfeit Detector with UV Lamp & White Light Area Black Pack of 1 Compact in size; powerful 9W long lasting UV lamp verifies the UV features in banknotes; ID cards; credit cards and all other official documents. Safescan LB-105 Rechargeable Lithium Battery For 155i Counterfeit Detector Pack of 1 Rechargeable battery for Safescan 155i. Safescan UV Counterfeit Detector Replacement Lamp 50/70 131-0411 Pack of 1 Safescan Replacement Lamp 50/70. Replacement Bulb for use in Safescan 50 and 70 UV counterfeit detectors. Safescan 40H Handheld UV Detector Pack of 1 Ideal for remote use and scanning for UV markings on property. 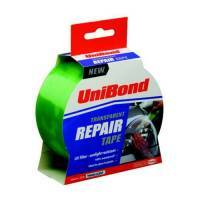 UniBond Transparent Repair Tape Pack of 1 Transparent repair tape.